Every good love story starts somewhere, even in a myth. There's no denying we love a good love story (the most obvious fact ever), but sometimes the best ones are the ones larger than life. They make us dream big and imagine even greater, which is a core step in living your best life, or love life for that matter. Science has even proven that people who dream more often have the ability to achieve greater things because they imagined the possibilities first. So, of course, we set out to find the five most romantic love myths, not that you need any help daydreaming. These mythical love stories are the kind storytellers yearn to tell. So after you read these romantic (and, of course, tragic) myths, pick up your favorite fantasy read from Harlequin or your favorite fanfiction website and let your imagination run wild. 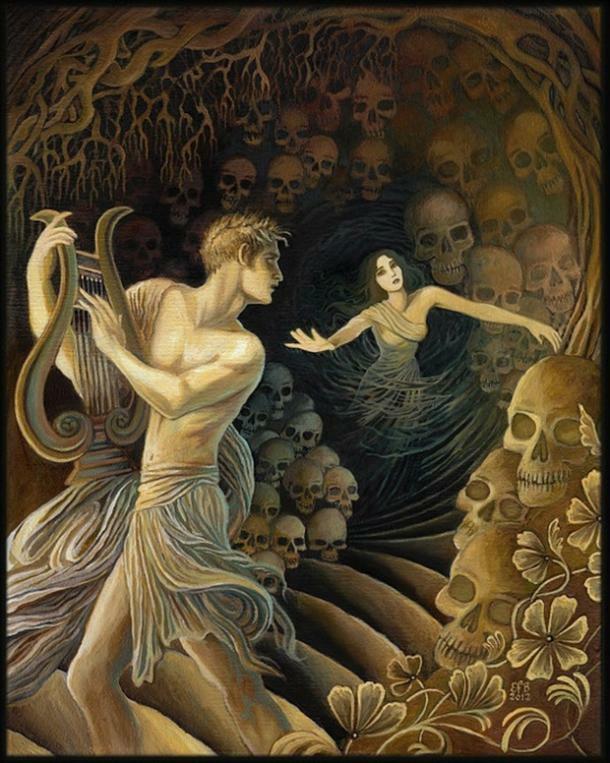 The story of Orpheus and Eurydice is one of the most romantic/heartbreaking stories from Greek mythology. You've probably heard this mythical love story because it's used to lecture impatient people, which isn't helpful. Orpheus fell in love with a nymph named Eurydice, who tragically died on their wedding day when she was walking down the aisle and stepped on a poisonous snake. Orpheus was able to make his way to the Underworld and used his musical talents to convince Hades to release his true love. Hades agreed, but only if Orpheus would lead his bride to the world of the living without looking back to make sure she was following him. Orpheus almost made it all the way to the surface before he couldn't control himself and turned around. Eurydice had been following him the whole time but once he looked at her she was immediately taken back to the land of the dead for eternity. Orpheus swore to never love again. Alcyone and Ceyx were the beloved king and queen of Trachis in Greek mythology. They loved each other so intensely that both gods and mortals admired their relationship. However, they both let this go to their heads a little bit and began to call each other Hera and Zeus, the king and queen of the gods. This didn't go over well with the real Hera and Zeus, who wanted to punish them. 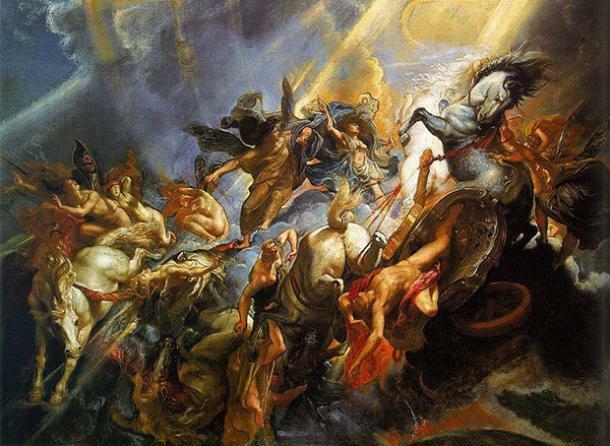 One day, while Ceyx was sailing back to his wife, Zeus sent a thunderbolt to capsize his ship and kill the king. Alcyone waited on the shore day and night for her missing husband to appear on the sea and prayed to Hera to return Ceyx to her. Hera took pity on her and sent Ceyx's body to wash ashore so Alcyone wouldn't have to wait anymore. Alcyone was so overcome with grief that she drowned herself at the sight of her dead husband, but Zeus turned them both into kingfisher birds that lay eggs on the water during the halcyon days when the ocean is calm. Torin, the Underworld lord responsible for death and disease, was the source of much unhappiness to both gods and mortals. His ultimate curse was that while he was unable to touch without causing decay, the lord of the Underworld wanted nothing except physical contact. When The Red Queen, a powerful deity named Keelycael, escaped from her imprisonment she set out to make Torin atone for the innumerable deaths he caused. Though Keelycael attempted to punish Torin and end his destruction, Torin eluded her trials in a game of cat and mouse. In a twist of fate, The Red Queen realized that Torin could be her ultimate match. Persian legend says Zal was cast away to a mountaintop when he was born. As he grew older, he was given a feather that he was told would keep him safe on his journey to be reunited with his father. During his journeys, Zal fell in love with the story of a beautiful woman named Rudabeh who had dark ringlets that reached her feet and long eyelashes. When he finally found his father, Zal was heartbroken to know that his family was actually the enemy of Rudabeh's. Against the odds, he found her and crept under her window one night where she let him climb up her hair. The two fell instantly in love, so deeply that their families couldn't deny the marriage and peace finally fell between them all. When Rudabeh was sick in labor with their son, Zal threw his feather into a fire to protect them both. Chih-nii was a god-like Chinese figure who's remembered for making gowns out of brocade and clouds. For her hard work, her father married her to a cowherd but she fell so deeply in love she forgot all her talent for sewing and making gowns. Her father was so furious that he sent them away, casting the Cowherd into the stars on one side of the sky and Chih-nii the Spinster into the other. Between them, he put the Heavenly River, also known as the Milky Way. The two are only able to see each other once a year when the stars align correctly. What Are The 3 Most Romantic Love Stories of 2013?